One of the methods for surface energy estimation [Jana et al, JNN 13, 3983–3989, (2013)] depends on correct measurement of contact angles. During contact angle measurement drop size, mechanical sock and evaporation of liquid are very important. Keeping all these in mind a setup for measuring static and dynamic contact angles of suitable liquid on various surfaces has been developed and is ready to work with. The whole instrument is designed and fabricated in this institute with the help of institute workshop very cost effectively. Detailed description of the setup is given in the following. This instrument is integrated by a digital microscope, sample stage, micropipette (2µl-20µl) and a light diffuser. The light diffuser is made by using flash light at the backside of stage. 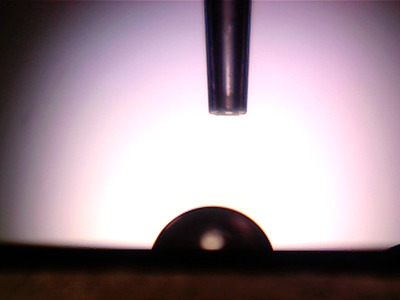 Magnification of the digital microscope is about 10X-300X, connected with computer for getting the video of liquid drop and contact angle is measured by using ImageJ software from the snap shot of the video in offline mode so that we can get the time evolution of contact angle. We are working on this for further development and trying to do automation.